Velocity® Lightweight Moisturizer works fast to smooth and soften. Plus, it contains an oil-absorbing ingredient that helps control excess oil it’s perfect for blemish-prone skin. Features a light and fruity scent. 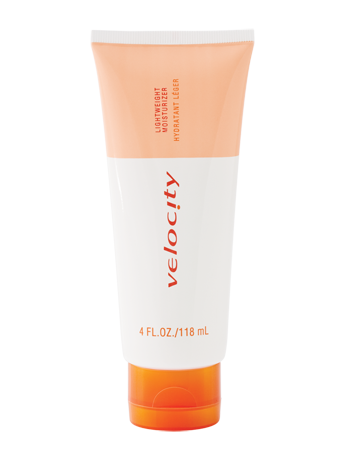 Velocity® Lightweight Moisturizer couldn’t be simpler. It’s created with younger skin in mind, which tends to be oily, blemish-prone, and can become dehydrated. Velocity® Lightweight Moisturizer is ideal for blemish-prone skin and for all skin types, leaving skin feeling soft and smooth. Apply to clean face and neck in the morning and the evening. Tocopheryl acetate (Vitamin E Acetate) is known as an antioxidant and helps protect the skin from the effects of free radicals generated by the environment. Arginine/amino acids and related ingredients (including peptides) are used to help maintain healthy skin. These ingredients are the building blocks for proteins, like collagen. This lightweight moisturizer softens skin and contains an oil-absorbing ingredient.